Indiana Gov. Mike Pence and Donald Trump at a rally Tuesday in Westfield, Indiana. UPDATE (July 15, 10:57 a.m.): Donald Trump has made it official, choosing Indiana Gov. Mike Pence as his running mate. The article below has been updated accordingly. Donald Trump announced on Friday that Indiana Gov. Mike Pence is his vice-presidential pick. Trump has done all sorts of unconventional, controversial things during this campaign, but making Pence his running mate is one of the least puzzling. Trump didn’t need to make a splash with his pick, and vice-presidential selections usually don’t matter. Moreover, Pence satisfies two key needs for the Trump campaign: He is less likely to harm the ticket than the other candidates on Trump’s VP shortlist, and he will likely make the conservative base of the Republican Party happy. Pence has a lot of experience in politics. The worst thing a vice-presidential candidate can do is make the presidential candidate look bad, e.g., Sarah Palin’s embarrassing moments during the 2008 campaign. Indeed, there’s some research to suggest that she cost Republican John McCain votes in 2008. Palin was a candidate with minimal experience in major elected office and was selected in a rushed vetting process that didn’t expose her flaws. Pence, on the other hand, served in the House from 2001 to 2013 and has been governor of Indiana since 2013. He has a well-established record. Trump knows what he was getting with Pence. Among the broader electorate, however, Pence is less well known. According to the most recent Marist College survey, 67 percent of Americans could not form a favorable or unfavorable opinion of him.1 That makes him look like a lot of vice-presidential selections since 1976 around the time of their selection. *Averaged from two polls. All percentages rounded to the nearest whole number. Pence is somewhat unpopular among the people who can form an opinion about him, particularly compared with past vice-presidential nominees. His net favorability rating would be the worst of any vice-presidential selection since 1976 at the time of their selection. But the other reported finalists, Chris Christie and Newt Gingrich, are well known and disliked by the American public. In the Marist College poll, Christie had a favorable rating of 34 percent and an unfavorable rating of 50 percent. Gingrich clocked in at 33 percent favorable and 53 percent unfavorable. Both are disliked by at least half of voters. The vast majority of voters, by contrast, don’t have an opinion on Pence, so the Trump campaign will have more of an opportunity to fashion a positive image for him (of course, that cuts both ways — Hillary Clinton’s campaign will also try to define Pence). Pence also is the most likely of Trump’s finalists to satisfy the conservative base. You can see this using three measures that I have used in the past to rate candidates’ ideology: DW-Nominate common-space scores (which are based on a candidate’s voting record in Congress), fundraising ratings (based on who donates to a candidate) and OnTheIssues scores (based on public statements made by the candidate). Pence scores a 50 or above on all three metrics (-100 is the most liberal, and 100 is the most conservative). His average score, 60, is higher (more conservative) than any other Republican vice-presidential nominee since 1976. Additionally, it’s higher than any of the other candidates that Trump was supposedly choosing among. Gingrich averaged a 49; Christie a 22. Although there’s certainly a danger in selecting such a conservative running mate (see Pence’s problems after Indiana passed its Religious Freedom Restoration Act), it is probably be a smart move in a season in which Trump’s main competition for the nomination, Ted Cruz, consistently did best among very conservative primary voters. Pence’s selection could make it a little easier for Trump to hold onto and energize Cruz’s voters, not to mention conservative leaders. 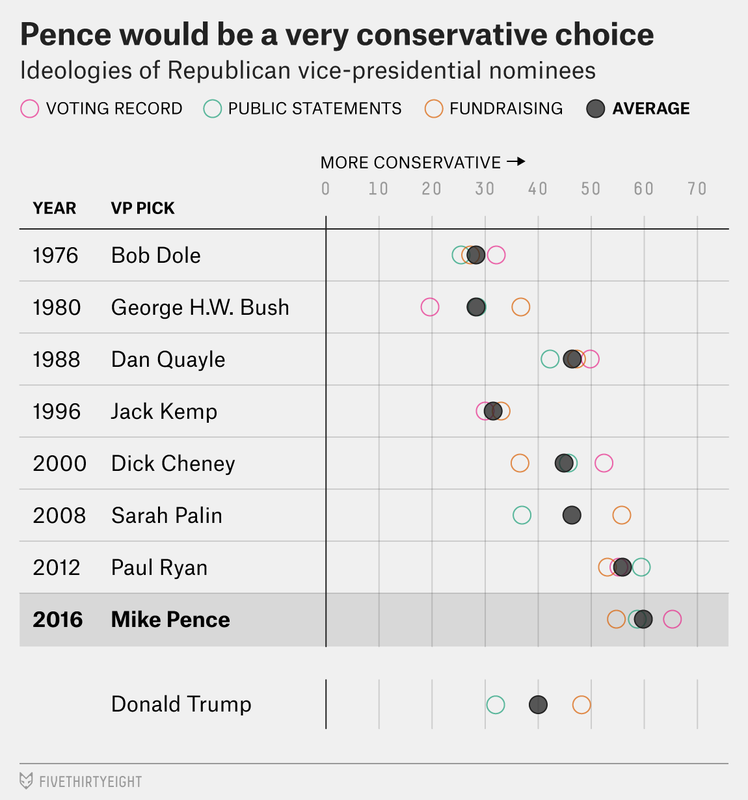 You’ll note on the chart that the closest comparison to Pence is now House Speaker Paul Ryan. Ryan has endorsed Trump, though he’s clearly not Trump’s biggest fan. Pence, however, is well-liked by Ryan — in part because they share a similar ideology. Overall, Pence seems like the safest pick for vice president among the candidates on Trump’s reported shortlist. He has governing experience at the state and federal level. He isn’t hated by the American public like Gingrich. And he won’t make the base run away screaming like the moderate Christie would. A just-released CBS News/New York Times survey found that an even higher 87 percent couldn’t form a favorable or unfavorable opinion of Pence.